Farmer's son who attended the Jesuit college at Caen, France at age 14. Joined the Congregation of the Oratory of France. Studied at Paris and Aubervilliers in France. Priest. 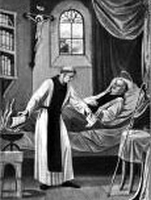 Ministered to plague victims. Missionary and preacher, working well over 100 missions. Worked against Jansenism. Established seminaries. Founded the Congregation of Jesus and Mary Eudists on 25 March 1643 to promote virtuous secular parochial clergy not bound by vows, but dedicated to improving the clergy through seminaries and missions; due to opposition by Oratorians and Jansenists, he never obtained papal approval. Founded the Sisters of Our Lady of Charity who worked for the welfare of penitent women. Author of the liturgical devotion of the Sacred Hearts of Jesus and Mary. Joined the Dominicans at Pisa, Italy in 1280. Educated at the University of Paris, France. Lector at Sainta Maria Novella church in Florence, Italy in 1305. Noted preacher in and around Florence. Founded the Confraternity of the Holy Redeemer at Pisa. Professor of theology at Saint James Friary, Paris in 1311. A visionary, Jordan had two great devotions - Our Lady and Saint Dominic de Guzman. Made a scientific study of the use of preaching as an apostolic tool. Considered a daring innovator for extending the use of vernacular Italian as a beautiful, musical language of evangelization; his use of Italian and Tuscan helped lead to the modern Italian language. Knew the breviary, missal, most of the Bible (with commentary), and the second part of the Summa Theologica by heart. Quick to state that learning alone can never make a preacher; it needed a holiness of life. Son of a Danish chieftain who had settled in England. Missionary in the Reichswald area of Germany, working with Saint Willibald of Eichstatt, Saint Winibald and Saint Boniface. Popular preacher who converted many, he later retired near Nuremburg, Germany where he would alternate life as a prayerful hermit and then a zealous evangelist. Son of Apollonius, a poor farmer. As a young man he worked as a shepherd to support his family and neighbors who were poorer than himself. Convert, baptized with his father by Bishop Redemptus of Trani, Italy. 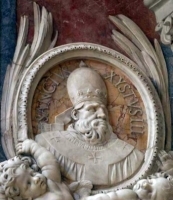 Magnus succeeded him as bishop of Trani, chosen by popular acclaim of the local laity and clergy. Evangelized in Fondi, Aquino, and Anagni. During the persecutions of Tarquinius, Magnus fled to Rome, Italy, but tried to secretly return to Trani. Found in a cave near Fondi by imperial soldiers. Martyr. Born to the nobility, the son of Charles II of Anjou, king of Naples. Great-nephew of Saint Louis IX, and of Saint Elizabeth of Hungary. Grew up in Provence (in modern France). Spent seven years as a hostage for his father at Barcelona and Tarragona in Spain. Ordained at age 23. Friar Minor. Reluctant bishop of Toulouse, France for the last six months of his life. Raised in a pious family in a pious town. Joined the Augustinian Recollects on 21 September 1864 at Montegudo, Navarra, Spain. Prior of his monastery. Ordained at Manila, Philippines on 3 June 1871, and became a well-known missionary. Vicar apostolic of Casanare and bishop of Pinara, Colombia on 23 October 1893. Bishop of Pasto, Columbia on 2 December 1893. Noted for his generous charity to the faithful of his diocese. Benedictine monk. Fourteenth abbot of the monastery of Cava de Tirreni in Campania, Italy, chosen on 25 January 1268, consecrated on 5 February 1268, granted a bull of confirmation by Pope Gregory X and served for 27 years. Partipated in the Council of Lyons in 1274, and used the trip to visit the abbey of Cluny and learn from the Cluniac monks. Built a new church and new cloister at his monastery, and had many new manuscripts copied for its library. Jewish Old Testament Matriarch. Wife of the Patriarch Abraham. A convert from paganism, she was the first female convert to the faith of Abraham. Nomad in the desert of Canaan. When she was aged 90, she heard angels say she would finally become a mother. She laughed at the idea, and when her son was born, she named him Isaac from the word for laughter. Chosen 44th pope in 432. Approved the results of the Council of Ephesus. Corresponded extensively with Saint Augustine of Hippo. Fought Nestorianism and Pelagianism. Restored several Roman basilicas including Saint Peter's and Saint John Lateran. Defended the supremacy of the pope over local bishops, and over Illyria which the emperor wanted to transfer to the control of Constantinople. Born to the Gallic nobility of Burgundy (in modern France), he was orphaned at an early age. Hermit on Mount Brufagaña for 30 years. Had the gift of healing by prayer, which he did for the governor of Tarragona, Spain. Imprisoned, tortured and martyred in the persecutions of Diocletian. Educated at Peterhouse, Cambridge, England. Convert to Catholicism. 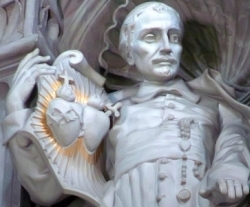 Studied for the priesthood, and ordained at Douai, France in 1612. Worked with covert Catholics at Dorset, England during a period of persecution. One of the Martyrs of England and Wales. Monk at Valdicastro, Italy. Hermit, joining the Camaldolese c.1285 at the San Salvatore di Acquapagana hermitage and living in a nearby cave. Studied at Tournai, Belgium. Headmaster of the cathedral school at Tournai. Visited Clairvaux Abbey to see Saint Bernard and ended by staying there. 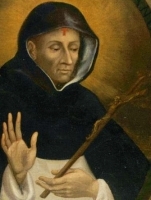 Sent by Saint Bernard to be the first abbot at Igny, France in 1138. Prolific writer, some of whose works on ascetism were sometimes mistakenly attributed to Saint Bernard. Soldier. Tribune in the Greek army. Convert to Christianity, along with a number of his men, following a miraculous victory over the Persians. Martyred by Seleucus as a group for their new faith. One of the soldiers in the Theban Legion who survived their massacre. He fled to the mountains of the Piedmont region, and became an evangelist. 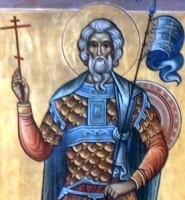 When his reputation for holiness spread, the same persecutors who had killed his brothers in the Legion tracked him down. Martyr. Deacon. Priest. Following a pilgrimage to the tomb of Saint Martin of Tours, he retired from world to live as a hermit on Mount Jura near Sisteron, Provence (in modern France). Reported to have the gift of healing by prayer. Bishop of Gaza, Palestine. Scourged, tortured and martyred by order of Urban, governor of Palestine, during the persecutions of Diocletian. Imperial Roman senator. Martyred in the persecutions of Commodus. Married. Father of Saint Agricola of Avignon. Governor of Avignon, France. Widower. Monk at Lérins Abbey. Bishop of Lérins, France. 7th century bishop of Vannes, Brittany (in modern France). Hermit. Founded the monasteries of Villars and Mauzac near Riom, France. Bishop of Châlons-sur-Marne, France. Envoy to Spain. Martyred by order of Urban, governor of Palestine, during the persecutions of Diocletian. Hermit in the forest of Entreaigues in Berry, France. Saint Gregory of Tours wrote a biography of him. Spiritual student of Saint Patrick. Monk. Founded the monastery of Louth, Ireland. Bishop of Louth. Monk. Abbot of Ainay Abbey near Lyons, France. Bishop at the monastery of Saint Peter in Besalu, Catalonia, Spain. Monk at Luxeuil Abbey. Abbot of a house in Bobbio, Italy. Married to Saint Calminius. Widow. Nun at Marsat, France. Long venerated in Mantua, Italy, but all details have been lost. A group of missionaries and their laymen supporters who were executed for spreading Christianity in Japan.